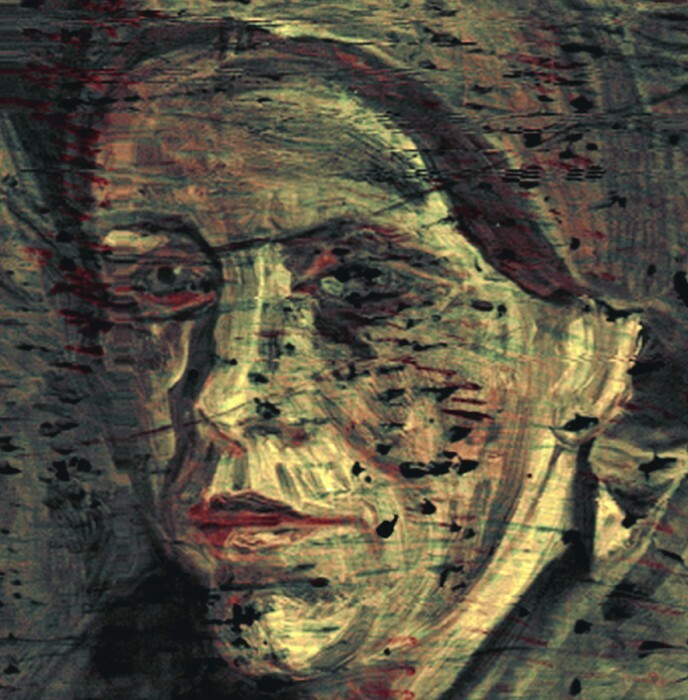 Published as: "Visualization of a lost paintig from Vincent van Gogh using synchrotron-radiation based X-ray fluorescence elemental mapping"
Many paintings by Vincent van Gogh cover a previous composition, because the artist frequently re-used the canvas of abandoned paintings. 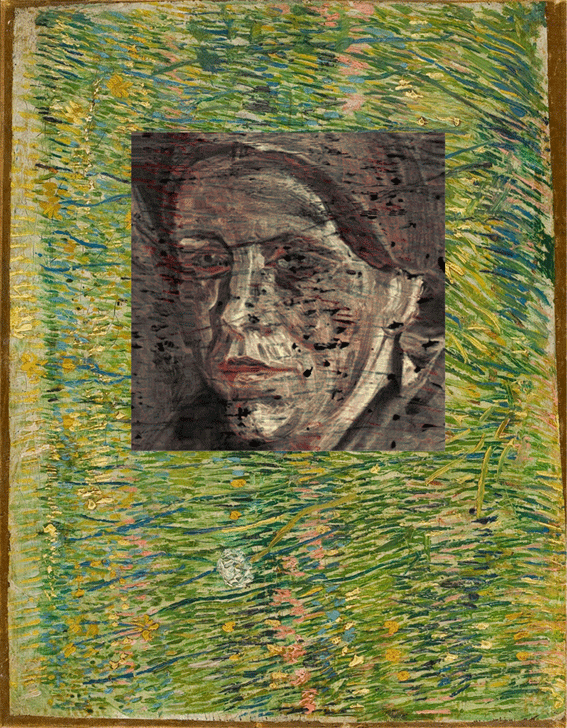 Using synchrotron induced X-ray Fluorescence mapping we visualized a woman’s head hidden under the work Patch of Grass. 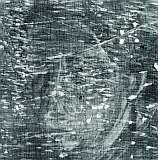 The resulting elemental distributions and additional X-ray absorption spectroscopy on selected points on the painting enabled an approximate colour reconstruction of the hidden face. 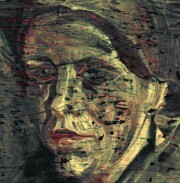 This proved to be the missing link in comparing the head with Van Gogh's known oeuvre. Vincent van Gogh (1853-1890), one of the founding fathers of modern painting, is best known for his vivid colours, his vibrant painting style and his short, but highly productive career. The artist would often re-use the canvas of an abandoned painting and paint a new composition on top (Fig. 1). These hidden paintings offer a unique and intimate insight into the genesis of his works. Van Gogh's painting palette contains a range of colours with an equally diverse chemical composition. Ranging from organometallic compounds, transition metals to heavy metals, van Gogh's pigments virtually cover the entire periodic table of elements. For the visualization of hidden paint layers, museums usually resort to tube-based X-ray transmission radiography (XRR, Fig. 2). 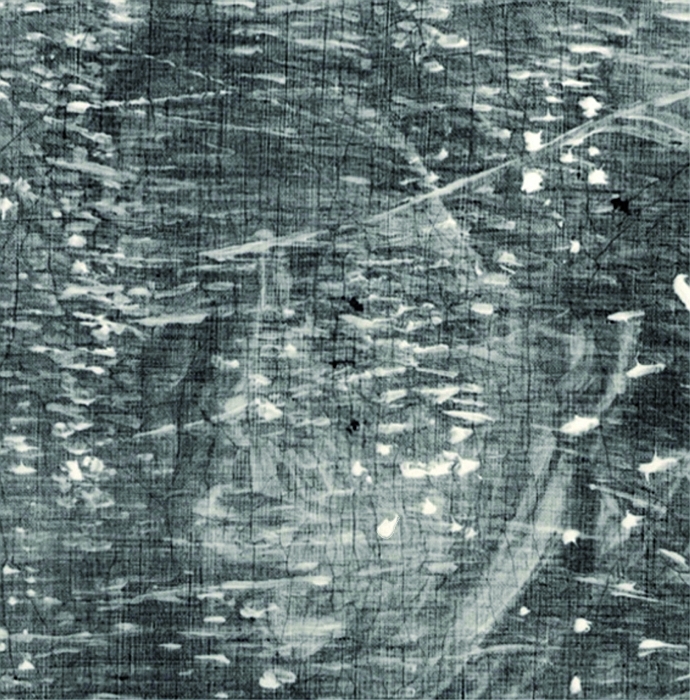 In these images, the absorption contrast is mostly caused by strong concentrations of heavy metal pigments, such as lead white. Other compounds, notably low concentrated or low Z pigments are obscured. 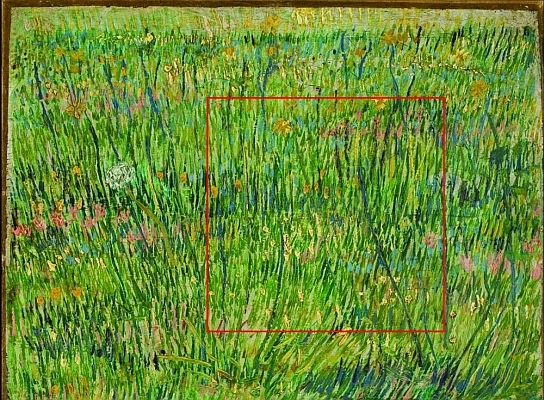 Earlier examinations with XRR of the painting by Van Gogh from his 1886-87 Paris period, Patch of Grass (Kröller-Müller Museum, Otterlo, the Netherlands) vaguely revealed a head under the surface painting. The facial characteristics could not be clearly read, making the person portrayed far from identifiable. Visualizing hidden paint layers, therefore, requires an elementally resolved view on the paint substructure. In order to obtain such elemental distribution images, we decided to scan Patch of Grass with X-ray fluorescence microanalysis (XRF, Fig. 3). In case that the detected element could not be assigned to a colour, in addition, X-ray absorption near edge spectroscopy (XANES, Fig. 4) was performed on selected points on the painting and on reference colours. Use was made of a pencil beam of high-energy, high-intensity synchrotron radiation so as to penetrate all paint layers. The experiments took place at HASYLAB at DESY in Hamburg. 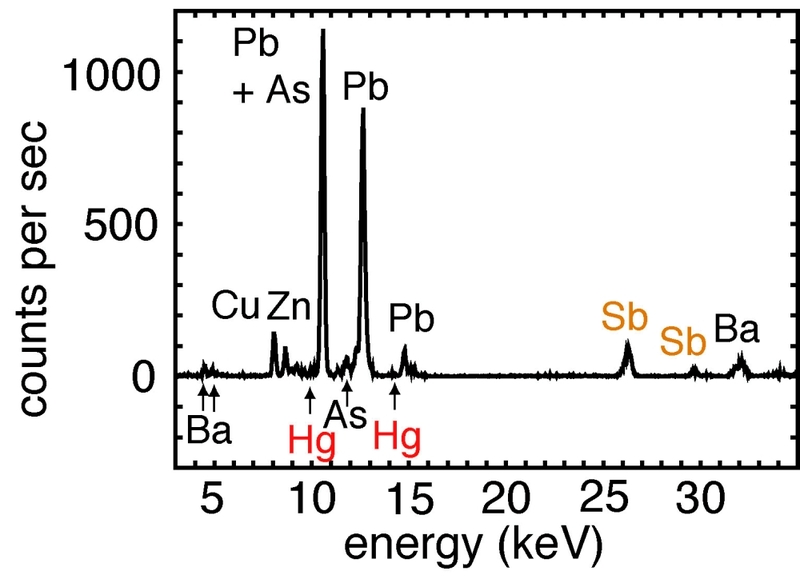 Three elements were found to overlap with the hidden face: Hg, Sb and Zn. Mercury is associated with the red pigment cinnabar and Zn with zinc white. Sb was found in the lighted parts of the face and XANES measurements revealed Sb to be present as Naples yellow. Based on these results, a tri-tonal reconstruction of the hidden head could be made. This approximate colour reconstruction presents a clear and detailed image of the hidden composition, including physiognomic details, as eyes, nose, mouth and chin (Fig. 5). 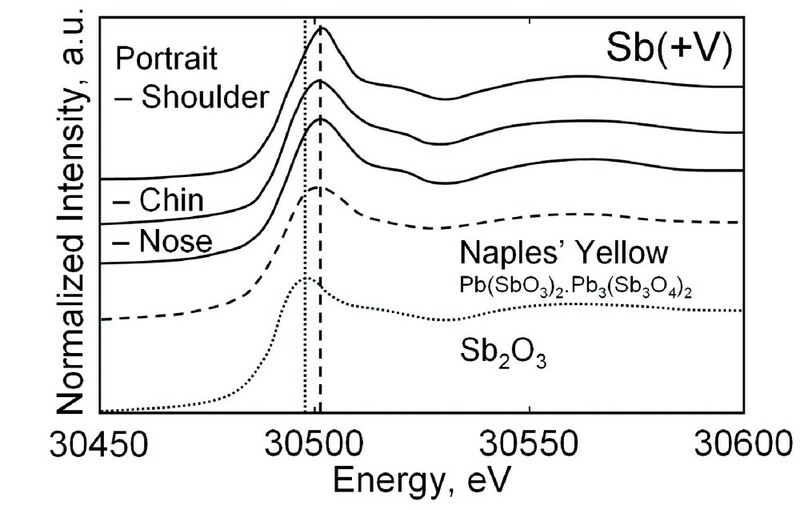 Figure 4: Comparison of Sb-K edge XANES spectra from three positions on the painting with reference XANES spectra of Naples yellow (Pb(SbO3)2, Pb3(Sb3O4)2) and antimony white (Sb2O3). All spectra recorded in fluorescent mode. Figure 6: Detail from Vincent van Gogh, head of a woman, Nuenen, winter 1884-85, Van Gogh Museum, Amsterdam. 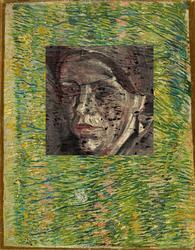 Our reconstruction proved to be the missing link in comparing the hidden face with the artist's known oeuvre. The hidden painting dovetails with an extensive series of heads from the artist's period in Nuenen (the Netherlands) in the winter of 1884/85. More specifically, the present head must belong to a smaller group of studies that Vincent gave to his brother Theo in Paris (Fig. 6), as mentioned in his letters2. 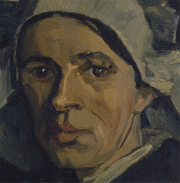 Two and a half years later Vincent went to join Theo in Paris and may very well have found the woman's head hopelessly old-fashioned by then. This can explain the presence of a colourful, Parisian style floral painting on top of a dark and sombre head of a provincial Dutch woman.